This week’s critical writing changed my understanding of how games connect to the physical world and to urban life. Let’s go on a little wander through the winding paths of online discourse. Slightly stepping away from our overwhelming reliance on text for critical communication, in these pieces critics use sound and visuals to explore games. 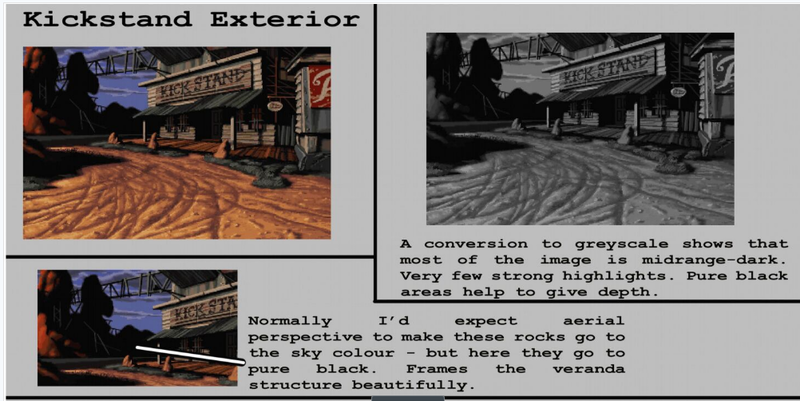 Ben Chandler carried out another in-depth visual analysis of point-and-click adventure sceneries, this time compiled into a PDF. Mike Diver engages in an experiment involving critical remixing of game audio. Don Saas’s writing reveals how game photography can function as a critical practice. The wilds and the cities have critics fascinated this week, as in-depth examinations of game spaces encompass all genres. Evan Conley leads us through a focused exploration of how a particular Zelda level frames player experience and narrative. Miguel Penabella analyses the architecture of contemporary China as represented in Kane and Lynch. Chris Priestman discusses modes of expression less concerned with realism and more with capturing certain impressions and atmospheres associated with urbanization. John Brindle discovers hidden forces more powerful than any game developer may have dared imagine. Eurogamer have done some compelling work this week on the social relationships that exist around games, with a particularly remarkable interest in how people relate to each other in the physical world. Craig Shields interviews coaches and teachers to investigate the impact of FIFA on children’s performance in football clubs on the ground. Simon Parkin remembers the solemnity and good humour of couch combat. These two pieces uncover new ways of understanding the involvement of politics and governance in gaming. Sam Machkovech finds in CIA game design a particular valorization of people’s ability to learn systems from the inside out. Finally, this last little bunch of pieces examines the different character roles we can play and interpret in games. Reid McCarter makes a great argument about the potential uses of games as a form for understated expression, through a reading of one recent example. Jynx Boyne discusses the identity positions encoded in the costumes of Journey. Ed Smith argues for more imperfect protagonists in games.